Aerodynamicists use wind tunnels to test models of proposed aircraft and engine components. During a test, the model is placed in the test section of the tunnel and air is made to flow past the model. Various types of instrumentation are used to determine the forces on the model. In some wind tunnel tests, the model is instrumented to provide diagnostic information about the flow of air around the model. Diagnostic instrumentation includes static pressure taps, total pressure rakes, hot-wire velocity probes, and laser Doppler velocimetry. A diagnostic test does not provide overall aircraft performance, but helps the engineer to better understand how the fluid moves around and through the model. Depending on the type of instrumentation used in the experiment, steady state flow or unsteady, time-varying, flow information can be obtained. 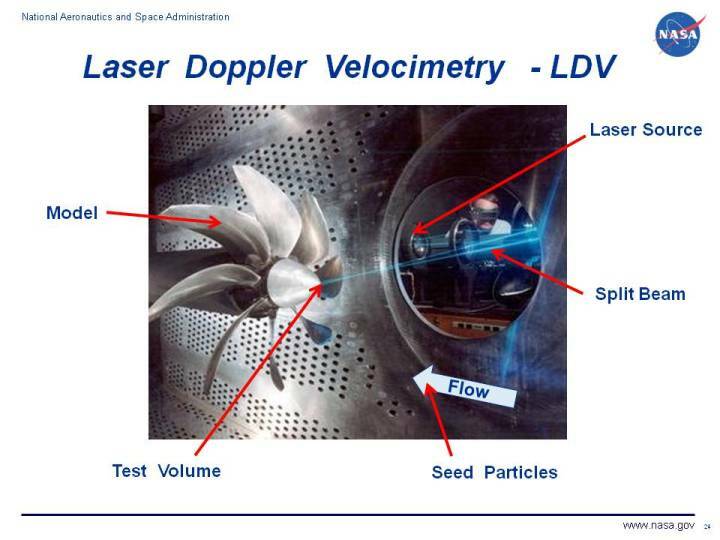 On this page, we will discuss the operation of the laser Doppler velocimetry, or LDV, system. There are two basic methods used to detect the passing of the seed particles, the forward scatter technique and the backward scatter technique. In the forward scatter mode, the detector is placed on opposite side of the tunnel from the laser source. In the backward scatter mode, the detector and laser are mounted on the same side of the tunnel. There are advantages and disadvantages to both modes. The forward scatter can use a lower powered laser, but requires optically flat clean windows on both sides of the tunnel test section. The backward scatter requires a higher powered laser, but only one window. The forward scatter can encounter problems from the model blocking the transmitted beams, the blockage does not occur in the backward scatter mode. A typical seed for an LDV system is an atomized light oil spray. The assumption that the particles follow the flow is true for small particles. If the particles become too large (10 - 15 x 10-6 m) they do not follow the flow. Of course, spraying the seed into the tunnel creates a cleaning problem when the test is completed. Laser velocimeters, optics, and electronic signal processors are all commercially available.